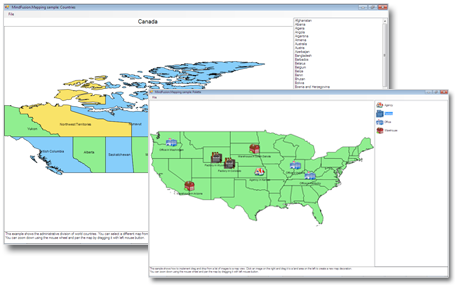 The full set of features to create, customize and display a map. With MindFusion.Mapping for WinForms and minimum efforts from your side you can represent the location of your offices worldwide, the areas where your products are sold, your distribution network and much more. The DecorationLayer of the Mapping component supports DecorationImage and DecorationBubble objects that are associated with a given latitude and longitude. You can use them to place images or text at precise locations. It is easy to see the tiniest details of your map with the built-in zooming of the control. Use the mouse wheel to zoom in or zoom out the map. Press the left mouse button at any area of your map and pan it by dragging the mouse. Each map can have unlimited number of layers whose visibility can be turned on or off. The MapLayer is used to hold specific data for the given map - locations, places of interest, important facts like rivers, cities etc. Each layer supports interactive selection and highlightning, which can also be enabled or disabled. 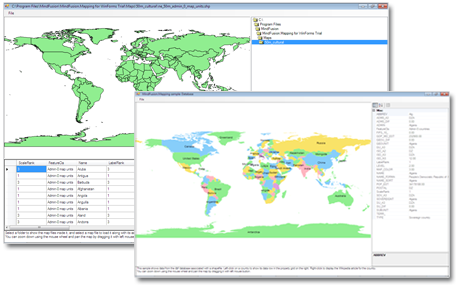 MindFusion.Mapping for WinForms offers you a big choice on royalty free files with a lot of administrative, geographical and political data, which you can use to mark cities, territories, roads, countries, oceans and many more. 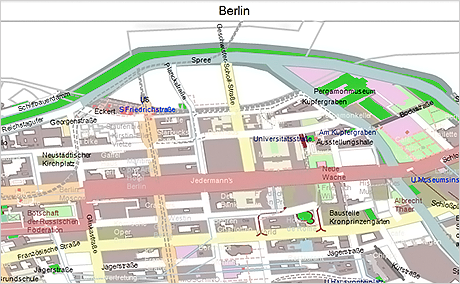 Use the integrated StreetMapLayer to enhance your WinForms software with street maps of your choice using MindFusion Mapping component and OpenStreetMap. The pens and brushes for the maps are customizable so you can easily change the appearance for the best possible result. The API is intuitive and straightforward to use: just call the Map's LoadFromXml method to load the corresponding *.osm file. Rendering a clear, easy-to-comprehend street map in a WinForms application has never been easier.